Here's the Pita recipe I promised you. It comes out of The Armenian Table. 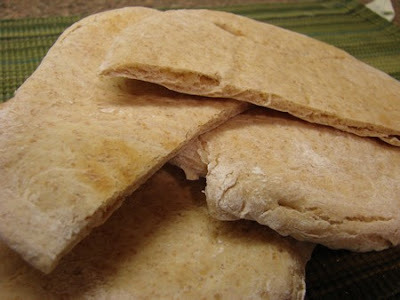 Pita is super with Hummus, either fresh or toasted. And I think the effort is worth it. Not every time you make Hummus, but sometimes. If you have a Bosch or other kitchen mixer, add the water, oil, sugar, and salt and spin. Add the first three cups of flour and mix to combine. Add the yeast and mix. With the motor running, add the last three cups of flour until the dough pulls from the side of the bowl. Knead for five minutes. Dump it out and form into a nice tidy ball. Put it into an oiled bowl and oil the top of the ball. Cover and set aside in a warm place for an hour or so until it is doubled in bulk. Punch it down and let it rest for a few minutes. Preheat oven to 500°F. Divide the dough into 12 equal portions. On a floured surface roll out each portion to make an 8 inch circle about 1/8 inch thick (get your tape measures ready :). Let each pita rest for about 10 minutes before putting them in the oven. Bake for 5 minutes, until the pitas are beginning to turn golden but not at all crispy. Halfway through cooking check the pitas to make sure they’re cooking evenly…you might need to rotate baking sheets or something. Of course, you don’t have to bake them all at once. Bake them in batches Roll out the last ones while the first ones are baking. The pitas may be served right away or toasted to get a nice crispy effect (which is quite good for Hummus). Or, cool completely and store in plastic bags at room temperature for up to 5 days.